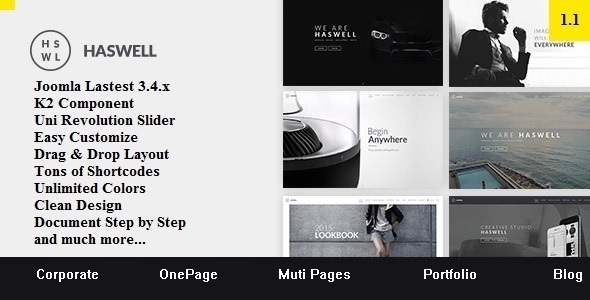 Haswell is a cross browser compatible, retina ready, responsive HTML5 /CSS3 template with touch support that features a clean and unique design that is multi-purpose template which is suitable for a wide variety of websites. Tons of Customizations are possible with this template that?ll help you redefine your website?s brand value. High Resolution: Yes; Compatible Browsers: IE9, IE10, IE11, Firefox, Safari, Opera, Chrome, Edge; Compatible With: Bootstrap 3.x; Software Version: Joomla 3.7.x, Joomla 3.6.x, Joomla 3.5.x, Joomla 3.4.x; ThemeForest Files Included: PHP Files, CSS Files, JS Files; Columns: 4+; Documentation: Well Documented; Layout: Responsive. Maxo - One Page Parallax Joomla Template; The8 - Corporate Business Joomla Template; BrickPress - Construction & Building WordPress Theme; Mitex - One Page Parallax Joomla Template; Stig - Multipurpose One/Multi Page Joomla Template; Bizness - Corporate Business HTML5 Template; Berg - Multipurpose One Page & Multi Page Joomla Template. Keywords: agency, blog, business, clean, cmsbluetheme, creative, elegant, joomla, K2, material, minimal, modern, multipurpose, onepage, portfolio.